CHIK Thick & Glossy black shampoo contains the goodness of Black Tea, Badam & Bhringraj oil. It helps to enhance hair shine & strengthens* your hair thereby giving you thicker** looking & glossy hair. 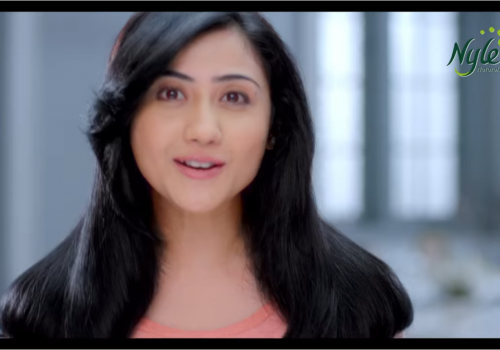 Get gorgeous looking shiny hair with regular use of CHIK Thick & Glossy Black shampoo. 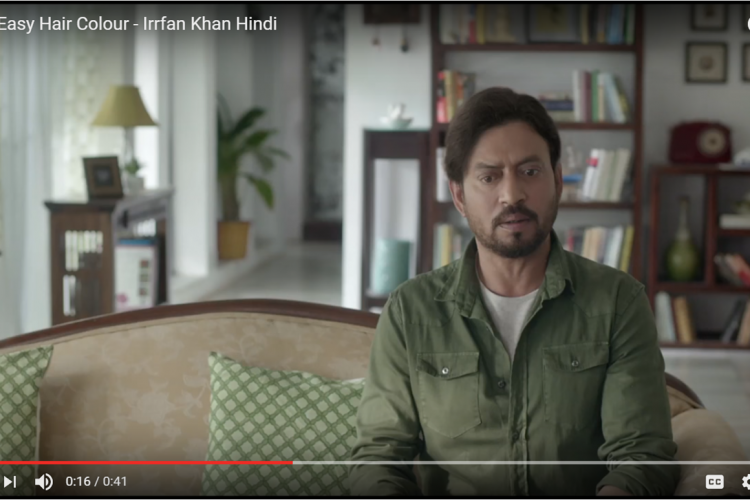 *Reduces hairfall due to hair breakage **based on consumer research study done in 2016. 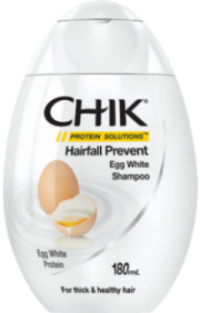 CHIK Hair fall prevent shampoo has goodness of Egg White Protein. It strengthens damaged hair by reducing hairfall* to give you thicker** looking healthy hair. *Reduces hairfall due to hair breakage **based on consumer research study done in 2016. CHIK Long & Healthy Jasmine shampoo contains the goodness of Aloevera and Soya Protein with the refreshing fragrance of Jasmine. It strengthens* hair helping you to get longer and thicker** looking hair. 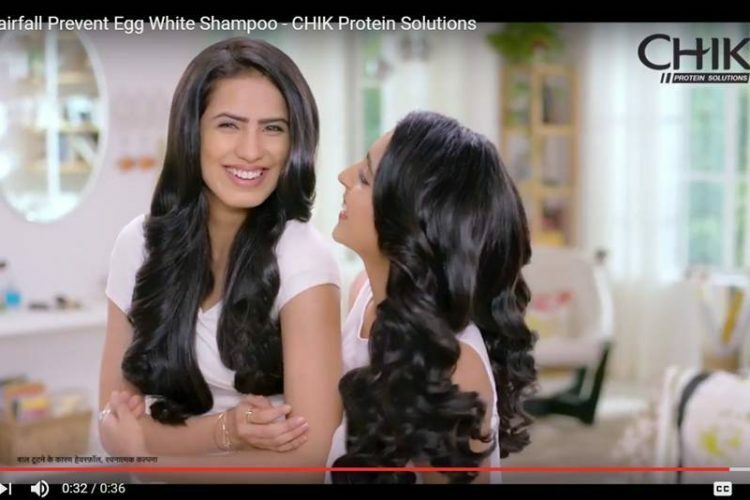 Get mesmerizing healthy hair with regular use of CHIK Long & Healthy Jasmine shampoo. *Strengthens by reducing hairbreakage. **based on consumer research study done in 2016. New Meera Anti-dandruff shampoo contains some of the finest natural ingredients and has been formulated under careful guidance of our haircare experts. Containing the goodness of small onions and fenugreek, now shrug off your dandruff worries with Meera Anti-dandruff shampoo! 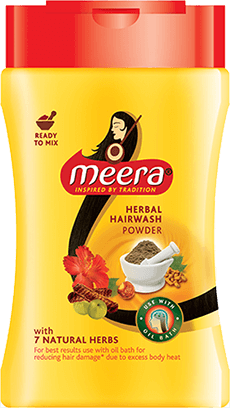 Meera Hair Conditioner is a healthy and traditional method of looking after your hair. It is made from natural ingredients which nurture and protect the hair making it soft and healthy. A perfect blend of flowers and herbs such as shikakai, green gram, tulsi, vetiver and reetha which cleanse the hair, leaving it fresh and shiny. Meera herbal oil contains 4 nourishing oils- ylang ylang oil, rosemary oil, coconut oil and sesame oil along with 12 hairfall fighting herbs such as curry leaves, black cumin, bringharaja, brahmi, amla, hibiscus & henna which are traditionally known to control hairfall. Meera herbal oil is clinically tested by a dermatologist & is proven to increase hair density & generate hair growth on regular usage. Meera Strong & Healthy Shampoo contains Kunkudukai that gently cleanses your hair whilst Vitamin E enriched Almond nourishes it from root to tip, giving you stronger and healthier hair with every wash.
*Hairfall due to hair breakage caused by manual combing of black hair tresses under laboratory conditions. According to Ayurvedic literature, one of the causes of hair problems could be excess body heat. The traditional routine of oil bath with Meera Herbal Hairwash Powder cools your body, strengthens and nourishes your hair from root to tip, giving you healthy and problem-free hair, naturally! Natural products are more beneficial and relevant even in today’s modern times. 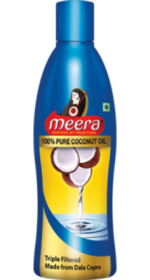 With this in mind, CavinKare launched Meera Pure Coconut Oil in January, 2008 with the intent of offering pure coconut oil to consumers. The best of ingredients and latest technology are combined to achieve goodness and purity. 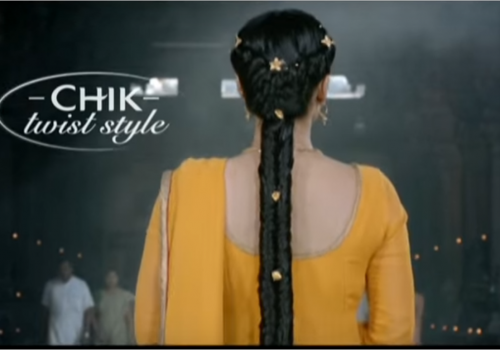 Shikakai has been used since ages to get naturally healthy hair. However, due to the cumbersome process, involving-grinding, making a paste by mixing with water & washing off, it has become practically inconvenient to use regularly. 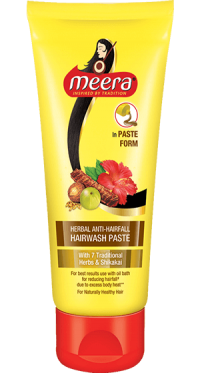 Rediscover the benefits of traditional hair care now in a whole new paste format with Meera Hairwash Paste – Squeeze, apply on wet hair, lather and rinse. 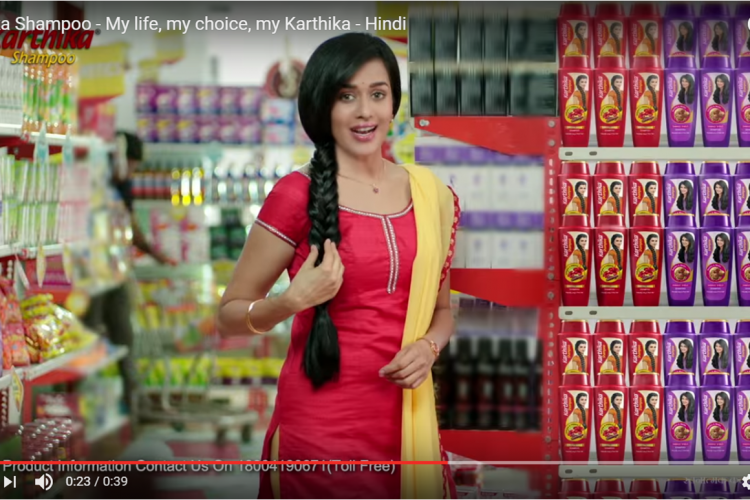 Hairwash paste reduces hairfall upto 92%** and it also helps to cool the body when used with oil bath. 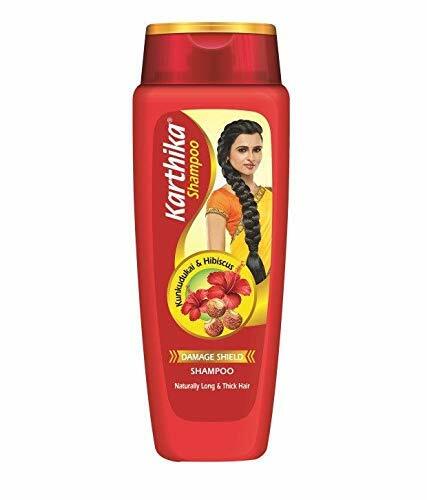 Karthika Damage Shield Shampoo, with the natural goodness of Reetha that cleanses the hair and Fenugreek & Hibiscus that conditions the hair, helps to shield your hair against damage. Every drop of Nyle Naturals Advanced Shampoo is Paraben free and filled with the goodness of natural extracts of Reetha, Amla, Blackberry and Lavender, helping you enjoy the long and Bouncy##hair. The pH balance of Nyle shampoo gives you the additional damage* protection. *damages caused by alkaline pH (increased charge on hair leading to friction & cuticle damage). ##Based on Consumer research study, 2016.Individual results may vary. Every drop of Nyle Naturals Advanced Shampoo is Paraben free and filled with the goodness of natural extracts of Aloevera, Tulsi, Amla and Green Tea. It fights dryness, giving smooth manageable##hair. The pH balance of Nyle shampoo gives you the additional damage* protection. Every drop of Nyle Naturals Advanced Shampoo is Paraben free and filled with the goodness of natural extracts of Shikakai, Amla, Hibiscus and Papaya. It repairs hair, strengthens it and makes it Silky Smooth.## The pH balance of Nyle shampoo gives you the additional damage* protection. #by reducing hair breakage, repairs surface level damage. Every drop of Nyle Naturals Advanced Shampoo is Paraben free and filled with the goodness of natural extracts of Aloe Vera, Water Lily, Lemon and Amla. It helps in repairing hair, shielding it from pollution###giving radiant shiny##hair. The pH balance of Nyle shampoo gives you the additional damage* protection. 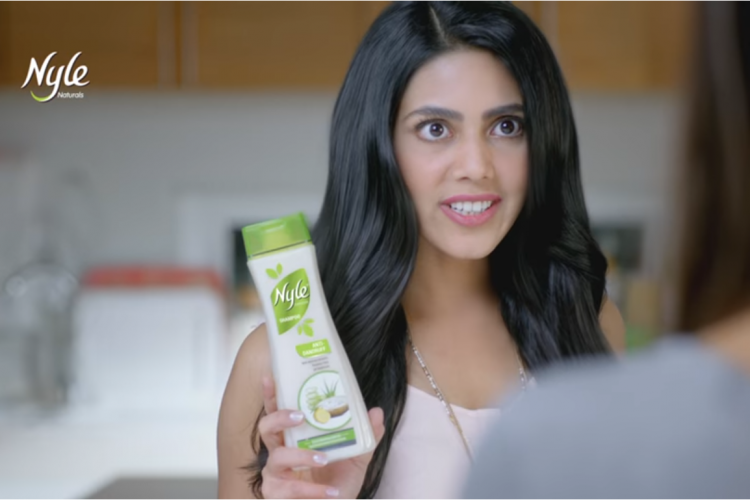 Every drop of Nyle Naturals Advanced Shampoo is Paraben free and filled with the goodness of natural extracts of Badam, Amla and Coconut Milk. 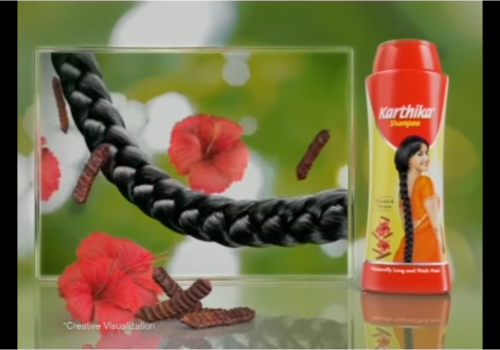 It strengthens#your hair and protects from hair fall due to breakage. It helps you enjoy strong & healthy##hair. The pH balance of Nyle shampoo gives you the additional damage* protection. Every drop of Nyle Naturals Advanced Shampoo is Paraben free and filled with the goodness of natural extracts of Curd, Aloe Vera and Lemon. 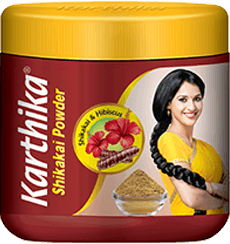 It not only fights dandruff but also smoothens##hair and helps to improve scalp’s health. The pH balance of Nyle shampoo gives you the additional damage* protection. 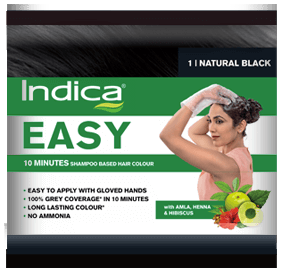 Indica easy is a revolutionary product in hair color industry. Gone are the days when you required brush and bowl for coloring hair. 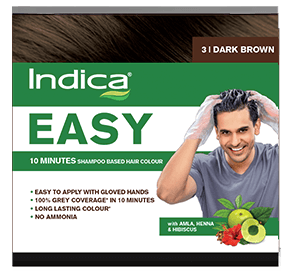 Indica easy comes in a shampoo based format which can be directly applied by hand with the help of gloves. It is one of the most convenient forms of applying color where you don’t need to seek anyone help for coloring. So why wait! Color your hair! Do it easy! Also available in Burgundy and Dark Brown. 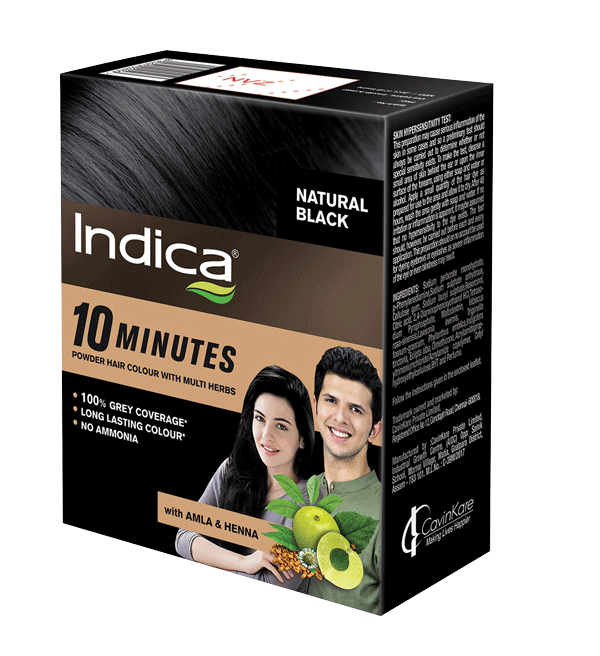 Indica 10 min powders was an Innovation in hair color industry , where you require only 10 min for coloring your hair as compared to longer time earlier. 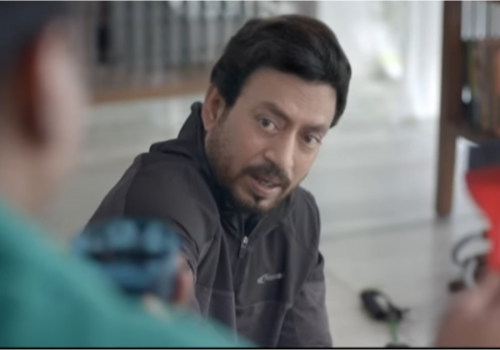 It acted as a boon to alot of consumer who in this fast paced life ,doesn’t have much time for grooming exercise. 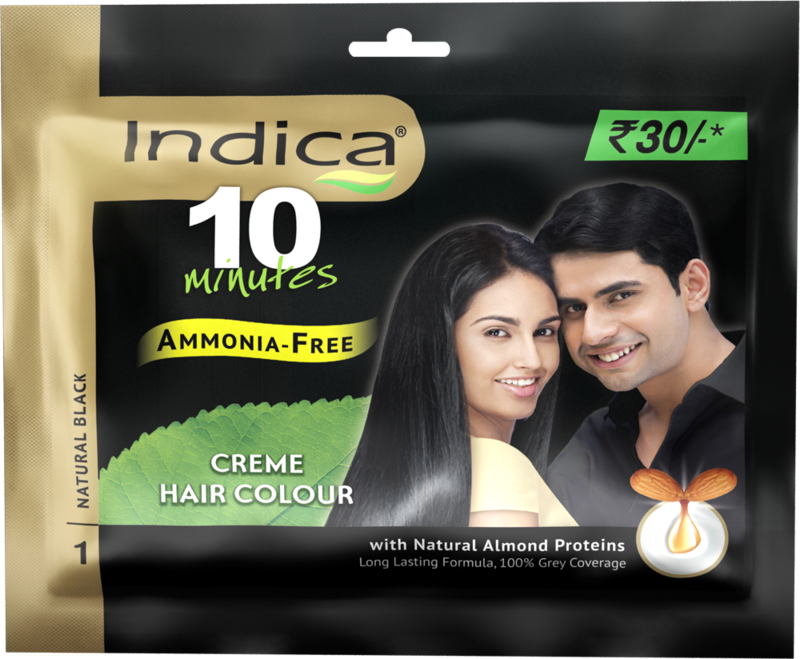 Launched in 2007 , Indica Herbals Hair Colour is made from a host of natural ingredients – Amla, Hibiscus, Methi, Henna and Bhringraj. 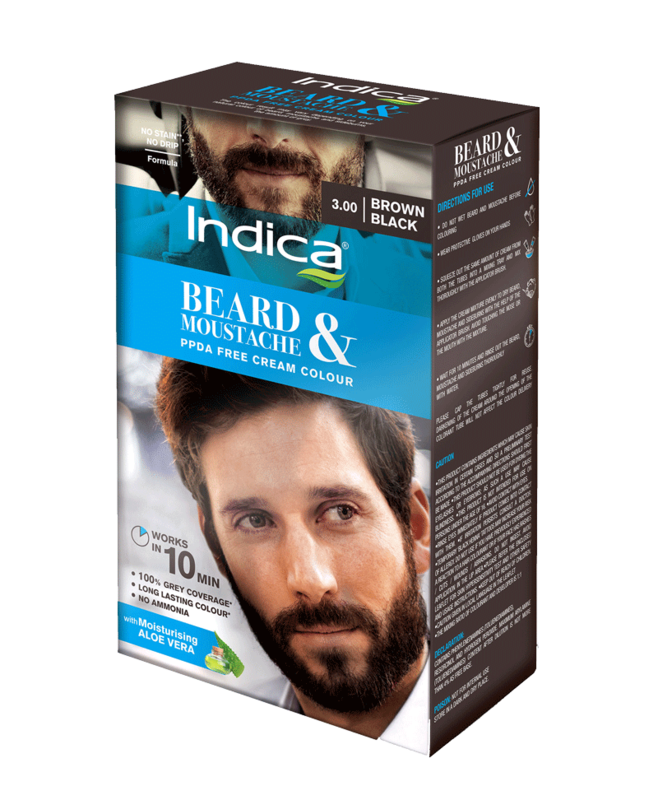 Indica Herbals Hair Colour is the ideal product for anyone who is young at heart with an attitude of never compromising for anything but the best. 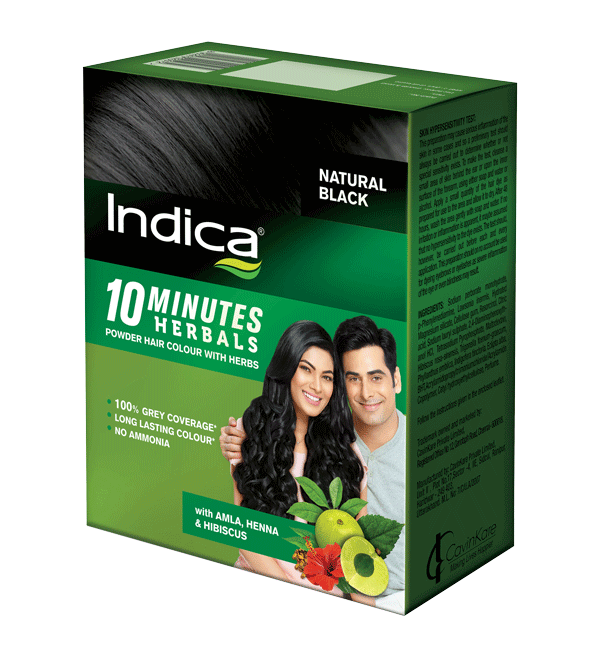 Recapture your youth naturally with Indica Herbals Hair Colour. 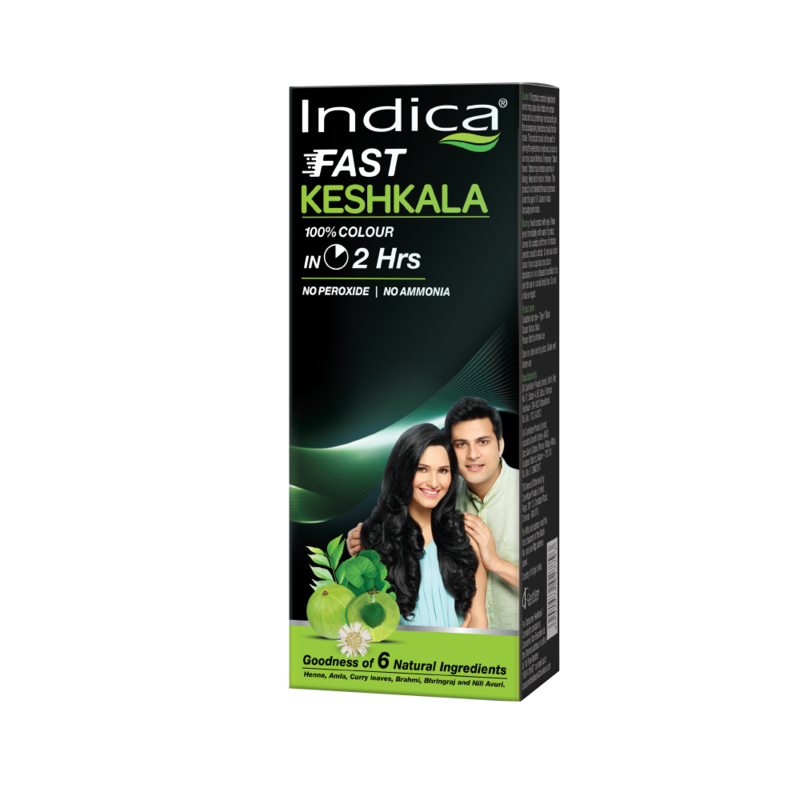 Presenting Indica Fast Keshkala with no peroxide, no ammonia but filled with the richness of 6 natural herbs that work with natural Oxygen of the air to cover your grey hair in just 2 hours! Also available in Burgundy and Black. This skin coloured cream makes your skin Soft and Silky. As it easily blends with your skin, it instantly covers all your dark spots and leaves you with an oil-free natural-looking glow. 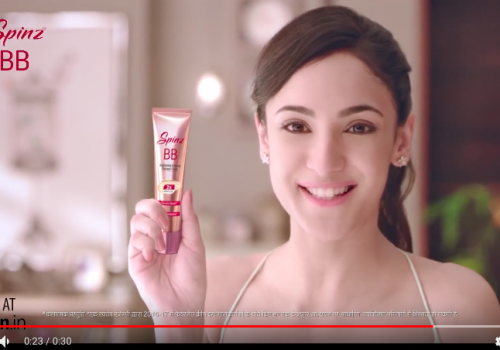 It’s so amazing that 89 out of 100 women have said that they loved so much, that they rated it better than their current fairness cream! Now you can get perfect looking skin every day! The new Thrillseeker perfumed deo from Spinz just gets you going. The fragrance begins with thrilling unique symphony of fresh Fougere-citrus cocktail and a delicacy of marine giving it a sense of cool icy-mist aromatic floral notes continue the thrill with a woody musk. 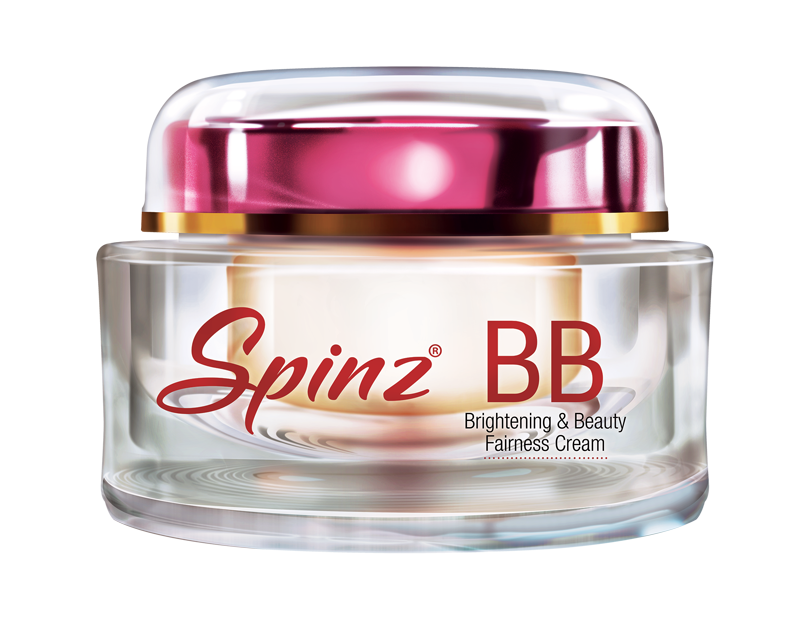 Now stop using regular white powder for your face, introducing specially formulated Spinz BB Talc. 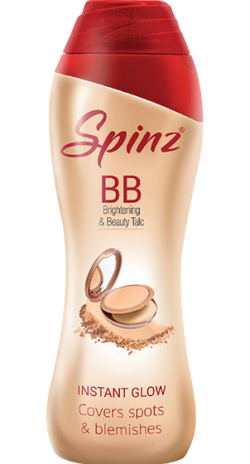 Long lasting freshness with Spinz Talc. The new Trailblazer perfumed deo from Spinz ignites the fire to race ahead. The rejuvenating fragrance is triggered with top notes of vibrant citrusy orange and guava, perfectly complemnted with middle notes of dewberry , lotus and jasmine as it finishes off with base notes of cedar wood and musk. The new Livewire Perfumed Deo from Spinz brings you alive with its irresistible addictive aroma of warm amber, vanilla flowers melting with tempting fruits such as peach and tangerine and highlighted with a touch of sweer chocolate followed by middle spicy notes of rose, lotus and cardamom. The new Hi Flyer perfumed deo from Spinz lets your spirits poa with a modern fairy tale fragrance and elegant citrus fruity punches of black currant, Bergamot Mandarin on the top with exotic floral landscape of Orchid, Ylang Ylang. The new Explorer perfumed deo from Spinz is for those who love to tread the unknown. A truly off beat fragrance which has top notes of a rosy transparent crystelline floral fragrance that reminds of a Dewy fields from France. The new Enchante perfumed deo from Spinz, is a truly enchanting fragrance with a top note of Citrus, Bergamot and Lavender. The new Achiever perfumed deo from Spinz fills you with a sense of achievement with its lingering fragrance of fresh floral and spicy citrus top notes. 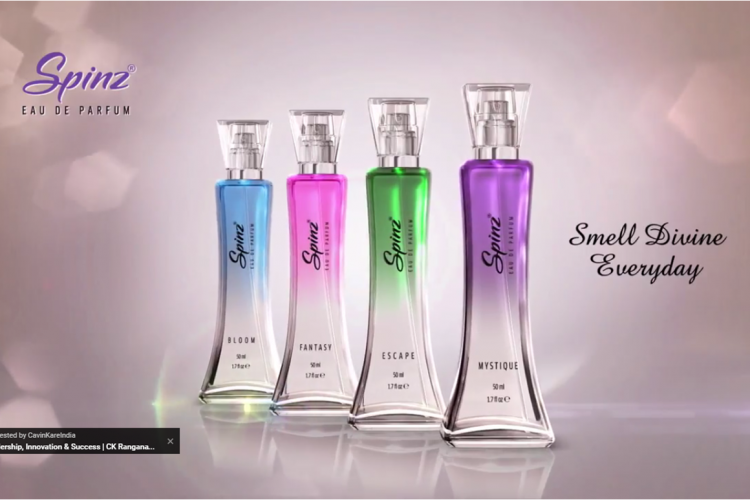 Spinz fantasy has a floral bouquet of jasmine, damask rose and ylang ylang, this fragrance will mesmerize youth fragrance evokes the image of a perfectly dressed confident lady who makes an indelible impression wherever she goes. Spinz escape is sensual and modern with enhancing citrus and aromatic notes the perfume captures the fresh, spicy and sensual scents of the Mediterranean. Spinz bloom, opens with a vibrant citrus top of orange and bergamot note, leading into a middle composition of lavender forger heart, creamy balsamic and soft woods underneath. Fairever brings to you, the goodness of Cow’s Milk and India’s finest Saffron sourced from Kashmir! These ingredients are known, for generations, to enhance skin complexion and texture. Presenting the all new Fairever Next! 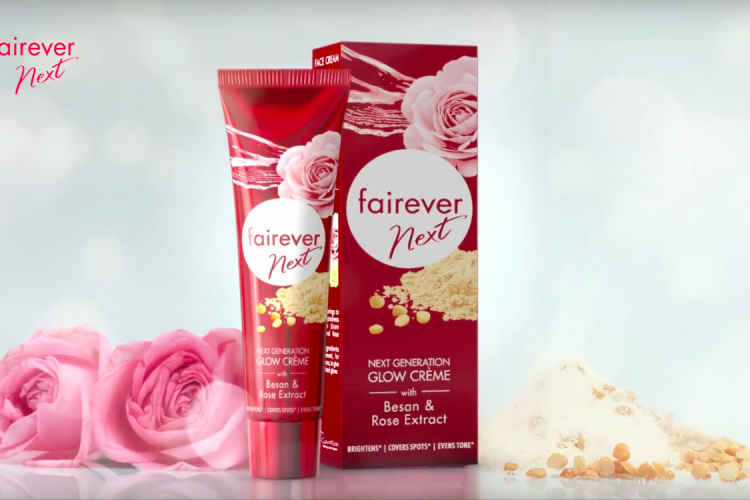 Fairever brings to you the goodness of Besan (Gram Flour) and Rose extract. These ingredients are believed for generations, to give unmatched glow.